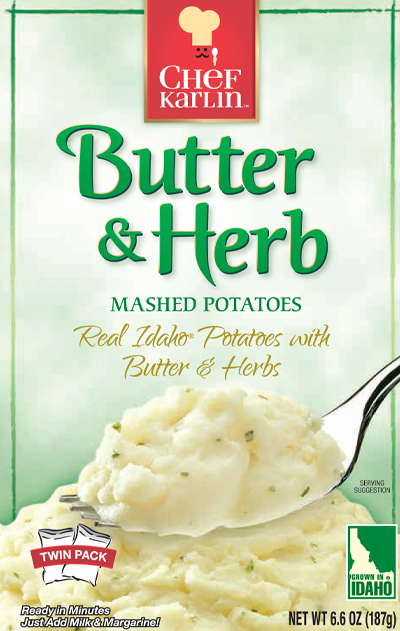 Ingredients: Potatoes*, Salt, Margarine (Partially Hydrogenated Soybean Oil, Salt, Nonfat Dry Milk, Soy Lecithin, Mono– and Diglycerides, Natural Flavor, Annatto Extract [color]), Butter (Cream, Salt), Corn Syrup Solids, Dextrose, Whey (from milk), Nonfat Dry Milk, Maltodextrin (from corn), Mono– and Diglycerides, Monosodium Glutamate, Parsley*, Artificial Flavor, Onion*, Whey Protein Concentrate (from milk), Dipotassium Phosphate, Spice Extract, Turmeric Extract (color). (Freshness protected by Sodium Acid Pyrophosphate, Sodium Bisulfite, Citric Acid, Tocopherols, and Ascorbyl Palmitate). Remove from heat and stir in one (1) pouch of seasoned potatoes until moistened. (Potatoes will become stiffer as they stand). If creamier potatoes are desired, stir in 1 tablespoon of milk at a time to desired creaminess. In a microwave-safe bowl, stir 1-2/3 cup hot water, 1/2-cup milk, 2 tablespoons margarine or butter and one (1) pouch of seasoned potatoes until moistened. Microwave on HIGH 2 to 6 minutes or until hot.